Call for special volume pricing! Easy installation thanks to Series 200 boltless design – no shelf clips required. Accessible from all four sides. 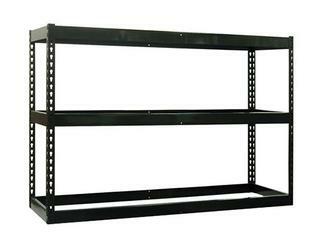 Shelves can be adjusted every 1-1/2". Each unit comes complete with uprights, left to right beams and front to back supports — whether it be shelving or bulk storage requirements. 40 sizes and styles available. Additional heights also available: 6', 8', 9', 10', 12' & 15'. We can build almost any unit from standard components. Additional shelves include: (2) Front to Back members and (2) Left to Right members.